Utah Landscaping Design provides a full line of excellent landscaping products for homeowners and businesses throughout the Salt Lake City area. With a large assortment of landscaping products, such as boulders & rocks, trees, shrubs, soil and bark, Utah Landscaping Design is the perfect place for the do-it-yourself gardener. They also offer a wide range of flowering plants and vegetables for Utah gardens. 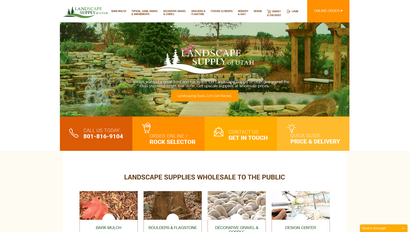 Friendly customer service and low prices highlight this Utah-based landscaping design company. Eric Morgan, serving as president and CEO, oversees every aspect of this business with his keen eye for detail. Mr. Morgan employs a team of professional web designers, programmers and writers to give each client an excellent value for their marketing and web design investments. Adaptivity Pro offers a wide range of services that includes SEO, PPC, web design and Internet marketing. Site designs and marketing campaigns are customized for each client and Adaptivity Pro strives to provide clients with top-notch, excellent customer service.